**** Chosen by Winner: Brad W.
NOTE: Restrictions on delivery of automatic knives in accordance with federal and state laws apply. Winner is responsible for compliance with all state and local laws governing automatic (switchblade) knives. Click for complete rules. 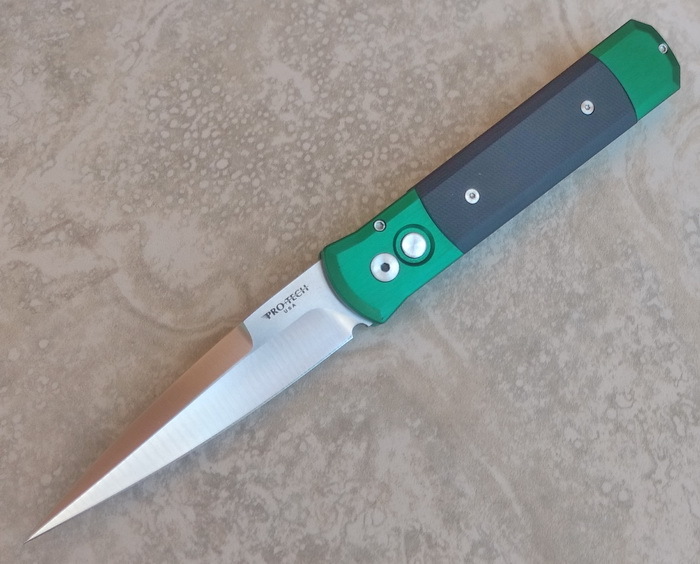 This Protech Godfather features a satin finished 154-CM stainless steel blade and a green anodized aluminum body with black G-10 inserts and a pocket clip. The design of the Protech Godfather automatic was influenced by the original Italian "Stilleto" knives. It features Protech's signature bayonet style blade, a slim handle and premium materials. The Godfather utilizes a coil spring for impressive push button action that never grows old. The build, fit and finish of the Godfather is exceptional, something that is true of all Protech knives. Horizon Bladeworks was founded in 1998 and, through great customer service, selection second to none and a “nac” for offering our customers what they wanted, and couldn’t find elsewhere, has grown into one of the Internet’s largest, most trusted and respected dealers of unique cutlery and related outdoor gear. Horizon Bladeworks specializes in automatic and switchblade knives of the highest quality from all corners of the globe. We are especially proud of our wide selection and deep inventory of the highest quality American made automatic knives as well as hard to find, unique, custom and novelty knives including a vast selection of genuine Italian and German switchblade and stiletto knives. Our customers will also find a variety of other knives and other items of interest to knife nuts such as flashlights, watches, rescue tools, pocket tools, swiss army knives and other gear of interest to like minds. We have a huge selection at amazing prices! Also, don’t miss out on free shipping on qualified orders.